The food is prepared by Head Chef, Darwan Ram and his team. Darwan has worked for some of the finest and well known names in Indian restaurants in London's West End, including: Soho Spice and Tamarind which has a Michelin Star. Darwan prides himself with the quality of food which he serves to the customers. Each dish is prepared in a loving and caring manner which is very transparent when the food arrives at your table. The presentation is first class and, whichever dish you choose, you will find flavors which complement each other, working together in total harmony. There is a lounge bar area and in the winter it has a roaring fire. There is also a restaurant area which will cater up to 20 and a private dining area which can cater up to 20 people, which is ideal for those special occasions, such as birthdays –private get together, Christmas & new year celebration something like this would be great here as you have all the ambiance of a traditional country Inn, with its real ales, with Indian food, the likes of which you will have never tasted before. Our starter platter for two, which is a chef's selection of their starters is a great way to try a small variety of the White Horse's range. There is an excellent selection of main courses that include, Chicken & Lamb dishes, Hyderabadi Biryani, with selection of meat as per your choice, cooked in a handi shape pot; Kebab platter is one of our popular main course option from the specials, Ladies love the tandoori Salmon (healthy option) which is marinated in Greek style yogurt with fresh mint, ginger, garlic and Indian spices. All curries are served with either rice or naan bread. All the Kebabs are served with curry sauce, option of rice or naan. The cuisine here is just like traditional Indian food, not like many other curry houses, which seem to play to what we here in the UK would expect. Indeed there is a comment on one website that says 'An Indian friend ate at the White Horse with us and said that her mother would greatly approve of the food", And Praised us that we serve the best Indian food in Hampshire.There is no higher praise than that! 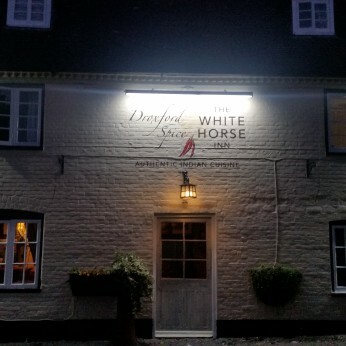 The White Horse is located on the A32 through Droxford. We also have a pool table, dart board, and a juke box in the public bar. We Show live sports in our family room with a huge television. We have a lovely beer garden for around 25 people. The pub also offers takeaway service for you to collect. What else you could ask for " The Perfect Package"
New Spring Lunch Menu Coming Soon !! We will be launching a new Lunch Menu Soon ! !